Stuck In The Buckosphere: Polar Vortex 2? I had some AMAZING photos submitted yesterday thanks to the snow that came through. 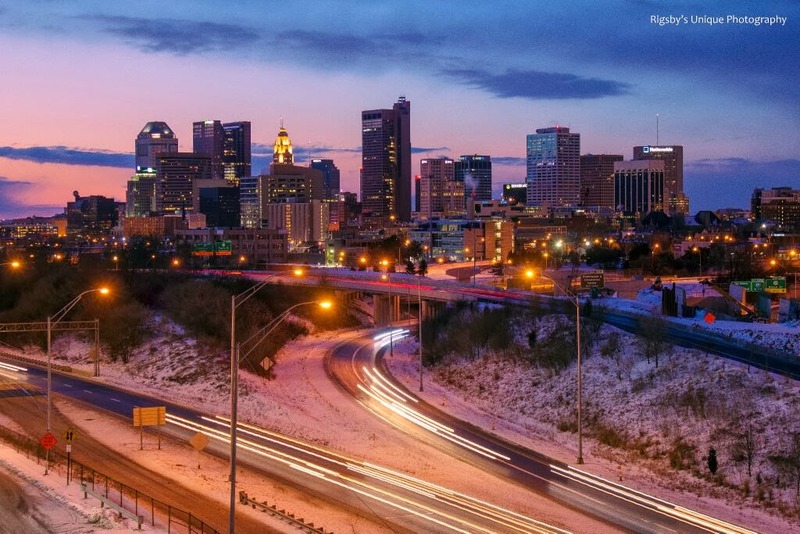 Aaron Rigsby sent in this great shot of the skyline at sunset last night. Love it! So a couple rounds of winter weather on the way. First off... Winter Weather Advisory until Noon Monday. That is followed by a Wind Chill Warning from Noon Monday until 1PM Tuesday. (All of these advisories are as of 5:09PM Sunday.) As far as Polar Vortex #2... I am sure media will take that term and bend it as far as they can. This is your typical winter cold front with more juice than normal. On to the breakdown... Temperatures will continue to warm Sunday evening ahead of a cold front. Shoveling snow will be a good idea Sunday evening before the Arctic blast arrives for the start of the week and turns slush to solid ice. Cold front Sunday night will bring light snow showers overnight into early Monday morning. Expecting generally less than 1" of additional snow by Monday morning. Falling temperatures through the day Monday. Strong winds will continue to cause blowing snow and very cold wind chills. Morning wind chills will be around -10 to -15 and Monday afternoon's chills will be between -15 to -25. The temperatures continue to fall Monday night with a low of -13 by Tuesday morning with wind chills between -25 to -35 Tuesday morning. We struggle to get back to zero for the high on Tuesday and then fall back to -7 for the low Wednesday. Warmer temperatures push in for the later part of the week followed by some snow possible Thursday and a wintry mix heading into the weekend. Stay tuned because models cannot agree on that exactly. Have a good one!